In the last couple of days, vitamin C and cancer has be come a hot news topic. For people who have followed this matter, the media's sudden interest comes as some thing of a surprise: the evidence that vitamin C is a selective anticancer agent has been known for decades . This story is important , as it illustrates how the head - in - the - sand conventional view ( that nutritional supplements are useless ) can lead to restrictive legi slation, reduced health, and limit ed approaches to the treatment of disease. The recent news story arose from a study by researchers at the US National Institutes of Health (NIH). 1 The NIH experiment showed that , when injected into mice, vitamin C could s low the growth of tumours. 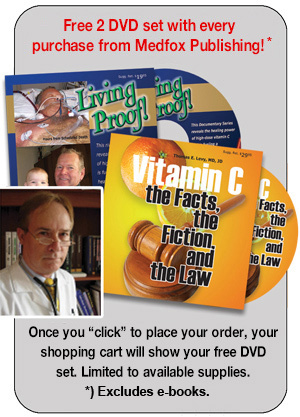 The NIH paper presents its findings as new , ignoring the long history of research into vitamin C and cancer. Far from being novel , many of the findings reported in this paper have been recognized for decades. What is strange, how ever, is that the media suddenly decided to report a story they had ignored for so long. In the 1970s , some members of the public and pioneering doctors experimented with high doses of vitamin C to treat cancer. By 1976, double Nobel Prize winner Linus Pauling and Scottish surgeon Ewan Cameron reported clinical trial s , showing an unparalleled increase in survival times in terminal cancer patients treated with vitamin C. 4 However, by this time Pauling was considered a quack , having claimed that vitamin C could prevent or cure the common cold , so these apparently amazin g findings made little impact . A long time before the NIH's mouse experiment, Pauling also studied the effects of vitamin C on cancer in mice. He worked with Dr Art Robinson but, unfortunately, the two researchers fell out over the ir interpretations of the results. Robinson l eft the Linus Pauling Institute (which he had helped establish ) and completed the experiment alone. It was eventually published in 1994. 7 The results were outstanding : mice with cancer that were given high dose vitamin C in the diet , or fed a diet of raw v egetables , lived up to 20 times longer than controls . Translate d into human terms , this might mean that a person with one year to live might get an extra 20. Importantly, Robinson and Pauling had been inspired to do this experiment by claims from cancer su fferers in the popular literature . The authors of this article recently reviewed the literature on vitamin C and cancer, in our book "Cancer: Nutrition and Survival". 8 We found solid evidence that vitamin C , in high enoug h doses , act s a s a selective anticancer drug. Furthermore, an understanding of its action provides insight into the cancer development process . O xidants , such as hydrogen peroxide , are able to make cells grow and divide erroneously . So, a s the cells divide , they form a population of varying cells that compete with each other for survival. It was immediately clear that oxidation could explain how cancer starts; following which Darwin's theory of evolution takes over. G iven enough time , cells divide and the " fittest" are selected. I n this context , the fittest to survive are those cells that grow rapidly to form an invasive cancer. Cancer is not a mysterious disease but is a result of straightforward biological processes . This microevolutionary model for cance r makes highly specific predictions. One is that h igh dose vitamin C should prevent cancer and even higher doses should kill cancer cells . The model also predicts that t here could be thousands of selective anticancer drugs . Animals , and especially plants , will contain these substances , because they evolved in the presence of cancer and had to develop ways to control it . If such predictions are correct, we should find a multitude of safe anticancer agents in food. C heck ing against medical databases, we immed iately found numerous examples, such as c urcumin from turmeric, alpha - lipoic acid, and vitamin D3 . Everywhere we looked, we found su bstance s with the predicted properties . Unfortunately, many are the very supplements the Alliance for Natural Health (ANH) i s trying to protect from being banned! T o conclude our history, t he NIH paper was essentially a repeat of previous animal experiments . Despite this, the NIH authors appear not to have referenced many of the scientists who did the original work on vitamin C and hydrogen peroxide in cancer . Instead, they present their work as stand ing alone , in an informational vacuum: with the exception of the Cameron and Pauling clinical trial, the original scientists' work is not mentioned in the NIH text. Wrongly, a read er might gain the impression that the NIH's work was fundamentally original , rather than repeating the work of others. This might mislead the media into ascribing credit for the work on vitamin C and cancer to the NIH , which would be unfair to the real pio neers of this subject. I would like to add one further comment about this report. Drs. Hickey and Roberts discuss what they would do should either of them develop cancer. Their approach is very sound, but it needs to be added that a total dental revision should always be part of any clinical approach to treating cancer, mainstream or otherwise. Vitamin C is important in treating cancer primarily because the prooxidative, electron-depleting, effects of an undiagnosed toxicity or source of toxicity in the body have not been addressed, and the collective body store of antioxidants is always substantially depleted. Root canal treated teeth and periodontal disease continuously release toxins of an extraordinary potency. Ultimately the presence of these conditions, by virtue of their relentless ability to deplete vitamin C and other antioxidant stores, is the single primary reason for the both the development of a very large number of cancers as well as their often inadequate response to whatever therapy is utilized.